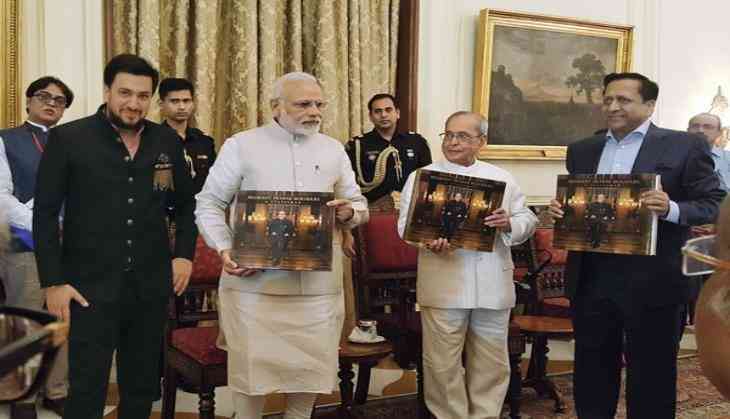 Prime Minister Narendra Modi inaugurated and released a coffee table book titled - "President Pranab Mukherjee - A Statesman Photographed And Curated by Varun Joshi" and presented the first copy to the President of India, Pranab Mukherjee, at the yellow drawing room, Rashtrapati Bhavan. Prime Minister Modi and President Mukherjee congratulated and complimented the ace photographer Varun Joshi for the wonderful work. The book launch ceremony was attended by many eminent leaders like Arun Jaitley, LK Advani, Prakash Javadekar, Maneka Gandhi, Rajat Sharma and many others bureaucrats from all walks of life. Prime Minister Modi spoke at length about how the President is always surrounded by important dignitaries and state protocols which hide his real self. People are not able to see how he is as a person. Here he mentioned how a good photographer can capture some candid moments which reflect the Presidents personality for instance a president laughing madly at some incident makes people feel that he is like one of us and many such rare moments and moods are captured beautifully by Varun Joshi in this beautiful pictorial odyssey. He also mentioned how in the past there were no cameras but today new technology has given birth to creativity and this creativity has led to the creation of this book which will create history and this has been done by Varun Joshi. He also congratulated the team of statesman and Varun Joshi who through his camera has beautifully portrayed the different facets of the President's personality and his true inner self, the journey of his life in the form of pictures. In this context, he emphasized the role of a photo journalist who only can understand which moods or moments are to be captured by the camera. He ended his speech by applauding Varun Joshi for giving priceless inheritance to the future generations of our country for years and years to come. The President in his speech appreciated and praised the role of photographer Varun Joshi for the important role played by him in compiling this book. He talked about how Varun Joshi had been with him for the last six months and how he had to travel with him on many occasions to keep up with his busy schedule and capture the different functions and how Varun worked tirelessly with the Presidents team to make this publication a success. "Working closely with Pranab Mukherjee was an experience I can never compare to anything else in life. It's not about photography here, but the life lessons I received just from observing him. To know such a humble gentleman from close quarters was a prized fortune, and I can afford to say that with pride. He is the most decorated politician India has ever seen, as his accolades are unparalleled," said Joshi. Being part of his entourage itself was a privilege which Varun Joshi reminisces fondly, "Capturing every important moment from his work was not as easy job, given the number of people surrounding him always. Yet he is the most accommodating and forthcoming person." The book gives a glimpse into the official and private life of President Mukherjee as he went about his job day in and day out, his tours, meetings with various statesmen, the innumerable inaugurations, conclaves, conferences, convocations, fundraisers, award ceremonies, addresses, ceremonial receptions and much more. The book chronicles the President's yetis choc-a-bloc with enough anecdotes and serves as an indication of his official schedule. It has been segregated into different sections, namely - India's Face, First Citizen, Knowledge Driver, Nation's Conscience, the Former Scribe, Supreme Commander and Many Facets. Though every page warrants a long look, there are few pages that are breath-taking. The Rashtrapati Bhavan is a site to behold on the Republic Day when it is lit up in all its glory. We all have been seeing the exterior shots of its grand façade, but Varun captures the ethereal beauty from inside, giving a whole new dimension to the word 'awe-inspiring'. A panorama shot where President Mukherjee, is stepping out of his chopper in Kolkata, while the Victoria Memorial serves as a backdrop to his aura, is simply magical. The shot of inauguration of Mughal Gardens is like a vivid painting. Also noteworthy is the shot of the Commander-in-Chief taking the ride on the royal chariot as he commences his journey towards the Beating Retreat from Rashtrapati Bhavan. The book also follows The President on his visits to important Raj Bhavans - Kolkata Raj Bhavan, Mumbai Raj Bhavan, Chennai Raj Bhavan and Ranchi Raj Bhavan. These imperial palaces are an architectural and archaeological delight.